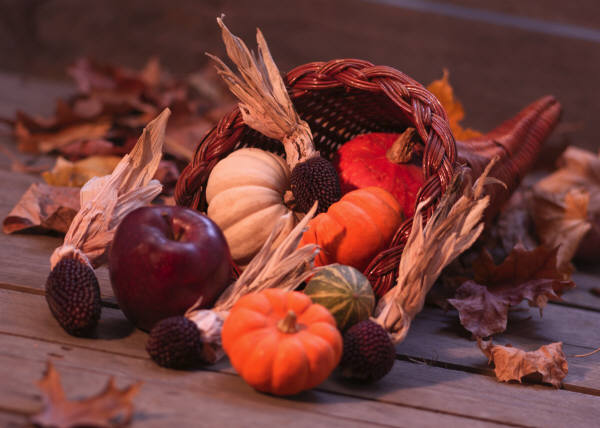 Giving Thanks – “To whom shall I give this grateful heart, this joy that shines through the center of my being?” A reminder to live with gratitude and love. Meditation at the Thanksgiving Table – “Let us remember those in need.” A prayer to be said together. A Moment of Blessing – “This is a moment of blessing. Blessings given. Blessings received…” Right here, this very moment, blessings abound. This Bounty – “In gratitude for these gifts, Holy One, Bless me with wisdom to use them with skill…” A prayer of thanksgiving. An Amazing Life – “This is an amazing life, a river of blessings, a gift to cherish in awe and wonder.” A prayer of gratitude for this amazing life. Harvest Prayer – “The yield arrives full and ripe, plump and ready, bursting in flavor, brimming with gifts…” In thanks and praise for the gifts of the land. For Autumn – “G-d of time and space, may this season be a blessing and a teacher…” A prayer for the autumn season. Life as a Banquet – “Grant me the grace to live my life as a banquet, a river of abundance and blessing…” The banquet of your life is full. Share your gifts. Share the Thanksgiving! For usage guidelines and reprint permissions, see “Share the Prayer!” For notices of new prayers, please subscribe. Connect with To Bend Light on Facebook and on Twitter.